I can’t remember the last time I read a positive article about corn. With the emphasis on genetically modified corn engineered by Monsanto for high fructose corn syrup and ethanol and the golden piles photographed in the Midwest as examples of excess of commodity crops we are hardly celebrating the tiny kernel. Except today— National Popcorn Day—January 19th. A day solely devoted to our favorite movie munchies and rainy day snack! The origins of January 19th as National Popcorn day are unknown, however if you want to celebrate and need some ideas for decorations or games head here. Also, a good friend of mine was kind enough to share her own Kettle Corn recipe (watch out because it's addictive! ), she also gives instructions on how to pop corn the old fashioned way with oil in a pan on the stove. It was a near miss, but thankfully I heard about National Popcorn Day before it had passed. We just finished ordering our seeds from the folks at Baker Creek Heirloom Seeds for planting the Heirloom Meals garden and selling on our website but I headed back over to their online catalog to read up on heirloom corn varieties with the dream of adding to our order a few packs of corn seeds. While Baker Creek sells 12 different heirloom varieties of corn their beautiful red Strawberry and dark brown Dakota Black varieties are both well suited for popping-you can check these out at the Baker Creek website. Most of us can name the breed of dog we own but can we name the breed of chicken our eggs come? Largely the chicken undertaking and research has been an experience in learning that “not all chickens cluck the same.” The number of eggs you get and whether your laying bird will ultimately taste good on the table has everything to do with the breed you select. The size and color of the eggs and personality of the chickens also varies considerably across breeds. Hugh talks about the Isa Brown and Welsomer as great layers, and Cuckoo Marans, Light Sussex, Dorking, Wyandott, Dumpy and Rhode Island Red as “good dual purpose birds”- for the eggs AND the table. 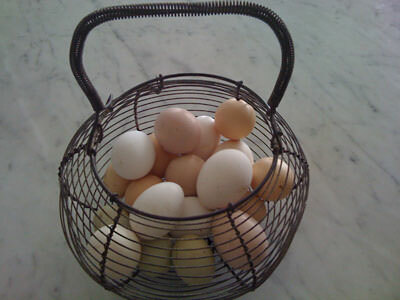 Our friends at Pete and Gerry’s Heirloom Eggs sell the eggs from two heirloom varieties- Ameraucanas and Marans. Ameraucanas lay beautiful pastel blue colored eggs and Marans lay brown eggs. These birds are well adapted to harsh environments as the Ameraucanas originated in the Patagonia and Marans were bred in France to be adapted to damp environments. For more information about either of these Heirloom breeds check out Pete and Gerry’s website. We are looking for guests to appear on the Heirloom Meals Christmas Special, which will air on PBS in December 2012. This is an incredible opportunity to share your family recipes and stories, but you must act quickly. Shooting will be at the end of March, and we need to meet with you and write a script well in advance of then. In order to be included in the Christmas special, you must be able to get to the Berkshires in Western Massachusetts, but once here you are guaranteed housing in a beautiful estate. Please include your interest, your availability, and the essence of your story. Please submit via email ALL the above listed information by January 20, 2012. There may be no better example of a poster child for Heirloom Meals than Hans Morris. 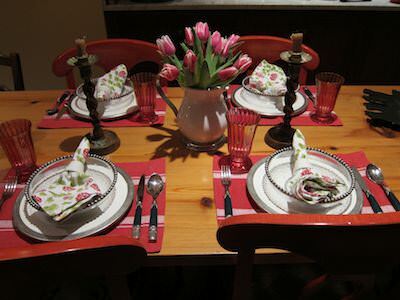 Hans shares a warm and charming account of his connection to food and meals through his memories about his grandmother's baking and Mom's culinary explorations. Hans began cooking as a young boy. He learned at an early age how to appreciate the nuances of cooking and baking by his successes and failures. He grew up with scheduled family meals and the ritual of the Sunday dinner. Hans is a true gourmand whose culinary curiosity engaged his attention. He developed his skills by experimenting and by throwing elaborate dinner parties in his twenties and continuing the tradition of Sunday dinner with his own family. Perhaps the greatest testament to the importance of the Morris family dinner traditions and culinary bliss was the cookbook that he and his 5 other sibling put together with recipes, stories and photos to honor their parents for their 50th wedding anniversary. A true treasure full of new and old heirloom recipes! Try this recipe for apple cake - you will not be disappointed!! Oh and listen here for his interview. With the holidays solidly behind us now, I have had time to reflect on my own personal conflict leading up to and during the holidays. I so want to recreate the Christmas of my past with those trays of cookies, memorable meals, festively decorated house and more. So I push and push myself, feeling bad if I couldn't muster the energy to make 12 dozen sugar cookies. Afterall my Mom and Nana could do it effortlessly. And then, reality struck. I work. I am traveling to NYC 2 days a week for a client, I am launching my dream company....my world is different. And that's just the way it is. 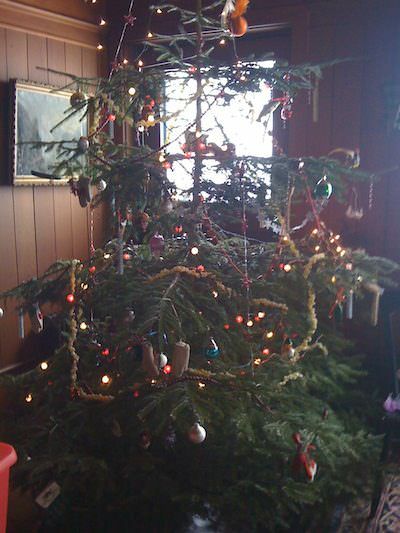 So I cut myself some slack and the joy of the season emerged. It's about sharing, giving, being with people you love. Not about how perfect you could make it seem. So as I pedal the importance of nostalgia and honoring the traditions of our ancestors and our treasured family recipes, I do it to embrace the love that was shared, not the fiction of perfection that I or many of us may carry in our memory. Sure, if you have the time, money and desire - go for it!! But, if you are like many of us during these economic times, it's about creating the loving, nurturing environment that hugs the hearts and souls of all that we touch. It's not about the 12 dozen sugar cookies. It's about the memory of them and how they made us feel. So, I was OK with making some memorable meals this season, sans sugar cookies. Funny thing, no one noticed I didn't make them.